There are a lot of short Steampunk films out there, but the folks over at First Step Cinematics tried their hand at a full-length Steampunk adaptation of Mary Shelley’s classic tale. With their small budget, this group of actors and filmmakers made an admirable effort. This is one of the most faithful adaptations of The Modern Prometheus that I have ever seen, and as a lover of literature I was glad to see it follow the book so closely. I really appreciated that the “monster” was given his voice and was fully articulate the way that Mary Shelley intended. So many film portrayals relegate the monster to groans, but part of the point of the book is that the creation is not so much a monster as a lonely and misunderstood human being. 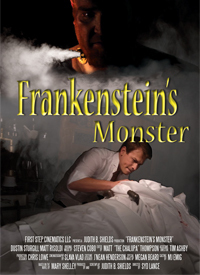 Also true to the original, the story is framed by Dr. Frankenstein’s time aboard a ship after pursuing the monster and seeking vengeance for the murders of his brother, best friend and fiancee, and the story is basically a flashback of his life as told to the captain and crew. In Shelley’s classic book, Victor never tells how he restored life to the monster for fear that others might try to follow in his footsteps. This allows great latitude for imagining the process, and the makers of this film chose steam power rather than electricity like those who came before. The monster has a really cool steam valve in his neck which is continually spewing vapor. But, for all the talk of how hideous he is, he isn’t all that monstrous other than that. I would have liked to see more scarring or make-up to make him look less life-like to justify the terror he instilled in those he met, but the performances of the monster and Victor were both full of emotion and well done. With a production budget size the cost of a small motorcycle, 86 minute this film was shot in 14 days. The film was created with DSLR cameras with manual focus at 24 frames per second. 12 Texas historical locations were captured in this film, including “The Hanging Tree” where criminals in Texas would be executed. Edwardian steampunk elements include: a laboratory inspired by Edwardian technology and apothecaries, 8 historical landmarks relevant to the film’s time, and the steampunk props were designed by local steampunk artisans. This microbudget film has been screened at over 30 film festivals, science fiction and steampunk conventions across the U.S.A., Canada, and the UK. All of the original music was composed and played by Ryan Cockerham. You can find this film on Amazon streaming and DVD. Phoebe Darqueling is a Steampunk artist and writer who currently resides in California, but whose heart will always belong in Minnesota.